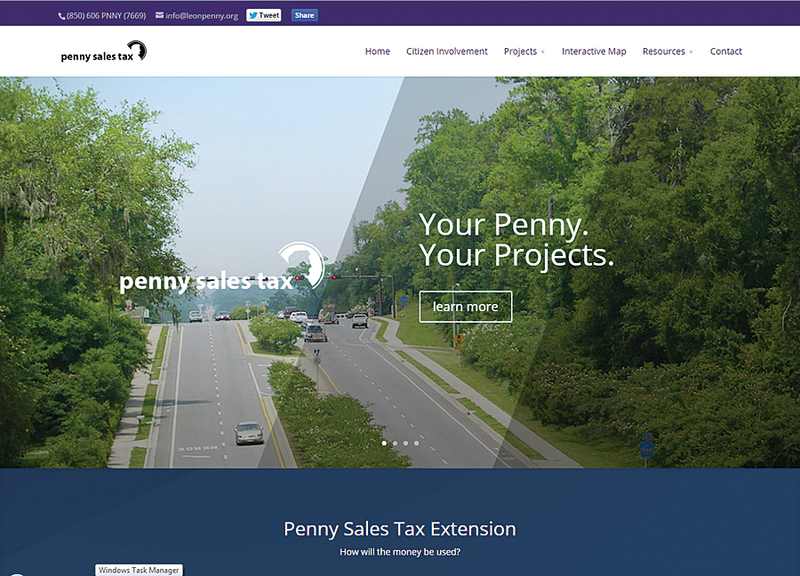 The Story Map Journal App Penny Sales Tax Extension is a central part of the user-friendly website. Rather than rely solely on pamphlets and PDFs to inform the citizens of Leon County, Florida, about the projects a proposed penny sales tax would support, the county decided to use the Esri Story Map Journal app. 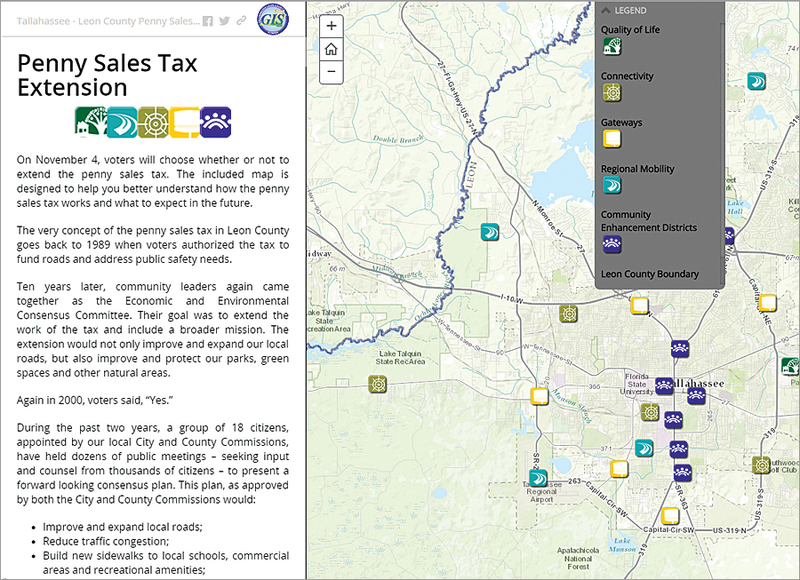 In advance of the November 4, 2014, referendum on extending a one-cent local government infrastructure sales tax for 20 years, Leon County launched Penny Sales Tax Extension at leonpenny.org, an interactive Esri Story Map Journal app. County staffers felt that a vote on such an important issue demanded lively, interesting educational materials for the public to review before they voted. Esri’s Journal app uses a mix of multimedia—maps, narrative text, video, images, pop-ups, and—in some cases, music—to tell a story. Although the app is popular for topics about history, travel, and conservation, the team from Leon County decided the mapping app was a perfect fit for answering the taxing question, How will the money be used? The mapping app’s left panel displays text and images that summarize and illustrate the 29 infrastructure improvement and economic development projects in Leon County that would be paid for with the penny tax. These projects include street and sidewalk improvements, new bike lanes, revamped bus stops, county fairgrounds beautification, and added park and green space. The mapping app summarizes and locates the 29 projects in Leon County that would be paid for with the penny tax. As users of this map app scroll down to each new section, a map on the right displays icons that show the general location of each individual project. Clicking an icon brings up a pop-up with a short description of the project and a related image such as a photo or artist’s rendering. The user can click for more information on this project link in either the story or map to obtain estimated project costs, a PDF with a more detailed map, and a form to fill out to connect with Leon County staff. Cristina Paredes, the county’s Intergovernmental Affairs and Special Projects coordinator, said voters are fans of leonpenny.org and its interactive map, whether or not they support the penny tax. They love the interactive map and being able to see where the projects are located. The interactive map, which has garnered thousands of views, is a more compelling way to present information than a simple document such as a PDF, according to Paredes. The story map also emphasizes the geographic diversity of the projects in 702-square-mile Leon County by showing that these projects are distributed all over the county so everyone will benefit. 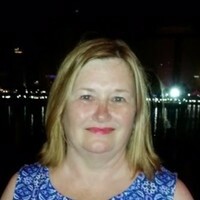 The user can click project links to get estimated project costs, a PDF with a more detailed map, and a form to fill out to connect with Leon County staff. 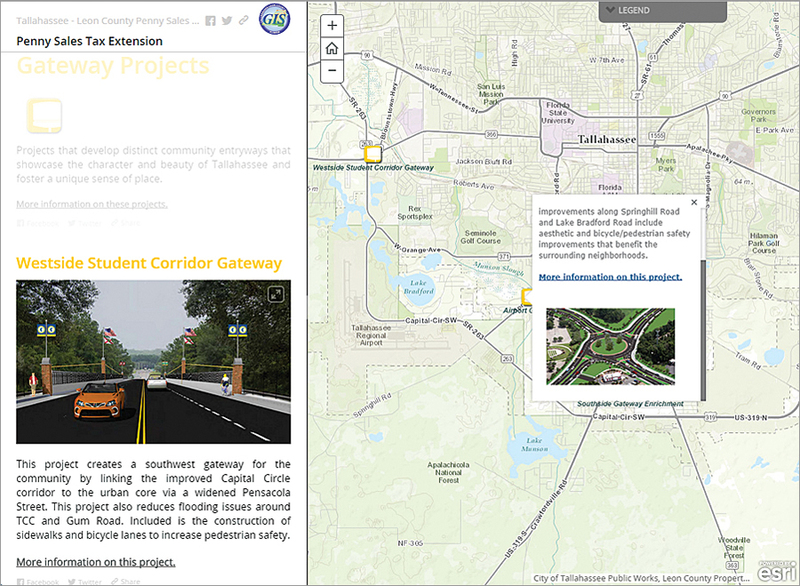 Creating the interactive map was a collaborative effort by Tallahassee-Leon County GIS, Community and Media Relations, DesignWorks, and the Leon County planning department’s urban design team. GIS systems integration specialist Ned Cake said the original plan was to display the projects using Esri’s Story Map Tour app or a custom version of a story map with tabs. However when Leon County GIS manager Scott Weisman saw Esri president Jack Dangermond introduce the Story Map Journal app at this year’s Esri User Conference, Weisman was sold on the app. Cake used Leon County’s ArcGIS Online organization subscription to launch Map Journal Builder and create a skeleton app. He loaded the Esri World Topographic basemap into the app, along with narrative text and photos and other images provided by Cavell’s office. He created a web map with editable features, and Community and Media Relations began populating the map with points. Cake worked with an intern to develop the pop-ups. DesignWorks created colorful custom icons for the map that matched the colors of the section headlines in the narrative panel. “It’s almost a work of art. We love it,” Cavell said. The app was not only created and launched using ArcGIS Online, but the app runs on it, too, so it is a 100 percent cloud solution.